I am using Ubuntu 16.04. 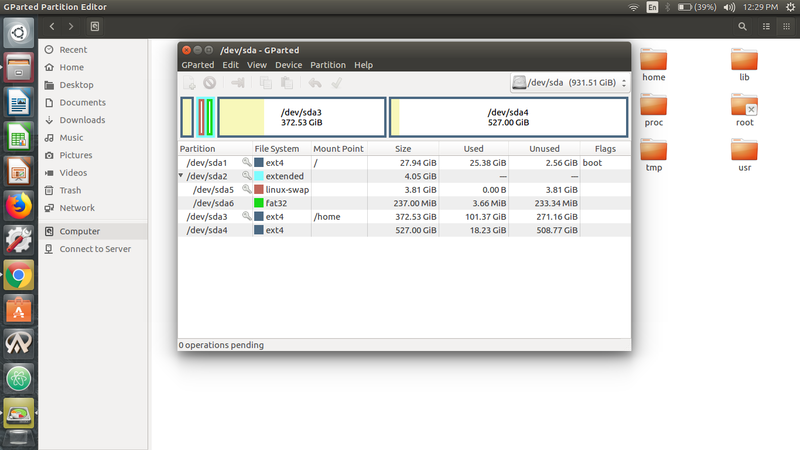 I have posted a screenshot of my partitions below. My root partition /dev/sda1 is almost full, and my /home partition /dev/sda3 has plenty of unused space. Is there a way that I can use some space from /dev/sda3 to increase the size of my root partition /dev/sda1 ? Not the answer you're looking for? Browse other questions tagged boot grub2 partitioning root or ask your own question. How to increase root (/) partition size using command line? How to increase size of root partition when not in order with home? Is it possible to resize my root partition without reinstalling Ubunutu [dual boot]? How to increase size of root partition at /dev/sda1 from /dev/sdb1?